Ha llegado inesperadamente un amigo, el cual se quedará a comer. ¡¡¡Qué problema!!! ¡¡¡Qué aturdimiento!!! Y a esto yo contesto: ¡Nada de eso! Manos a la obra, y mientras el esposo lo obsequia con un “cocktail” o “highball”, nosotras hábilmente, sin carreras ni precipitaciones, preparamos un menú sencillo y atractivo. 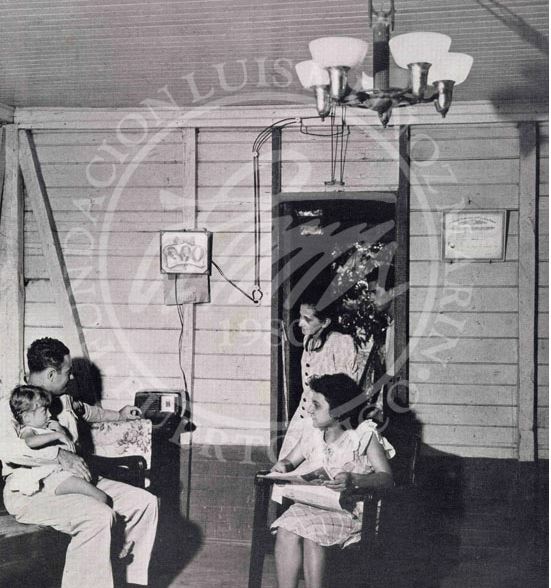 Family listening to the radio in a rural home in Puerto Rico, circa 1950. Source: Colección Fundación Luis Muñoz Marín. The 1950s was a period of economic, societal and political changes in Puerto Rico. The decade brought the establishment of Puerto Rico’s current political status as a commonwealth of the U.S., and the adoption of its constitution and flag. This was also an era of political turmoil and government repression. Amidst these changes, Carmen Aboy Valldejuli published the first edition of Cocina Criolla, in 1954. This cookbook has been used and cherished by many through different generations, this despite other cookbooks written during that time (including the 1950 Cocine a Gusto) and since then. Why is Valldejuli’s book the one with staying power in our culinary imaginations? We don’t find much written about Valldejuli’s life, aside from the autobiographical notes in her books and a few newspaper articles. Valldejuli was born in 1912 (or 1918), less than two decades after the 1898 United States occupation of Puerto Rico. Born into the well known Aboy family, her privileged upbringing kept her out of the kitchen. She lived in a home with plentiful servants and a father who enjoyed fine food. In her twenties, she married another man who loved fine food, Luis Valldejuli. A ponceño who became her life and business partner, even co-authoring a book together titled Juntos en la Cocina. The Valldejulis loved entertaining and enjoying the company of others over food. 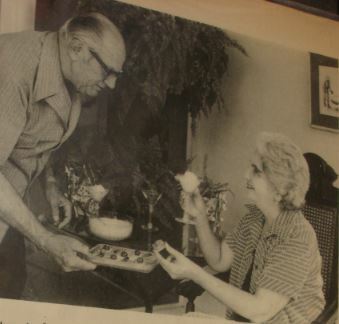 An article from the Milwaukee Journal in 1968 cites Mr. Valldejuli as saying, “When I come home, I never know how many people I’m having for dinner”. This love for entertaining is reflected in her book. She dedicates a chapter to the requirements of the formal dinner, including indispensables such as guests, a table and chairs, and specific guidance concerning the help, “competent” and “appropriately uniformed”, among other things. Valldejuli also offers tips on what to do with unexpected dinner guests, mostly a quick menu from different canned and jarred foods. Was Mrs. Valldejuli the one opening the cans and preparing the snacks for the unexpected guests? The same 1968 Milwaukee Journal article, describes the Valldejuli home and kitchen. A “large glass front living room” opens to the terrace. Walls are decorated with Spanish fans, antique lace and modern paintings. The kitchen is large, perhaps matching the “imposing” 16 foot black mahogany dining table. In the kitchen we find Francisca Falu, mentioned in passing, almost as an accessory. Ms. Falu had been with the family for 30 years (by 1968) and she was the one in charge of doing the family cooking. I had heard of Francisca before, as the black woman in Valldejuli’s kitchen, but I have not been able to find any other documentation about her aside from that short reference in the Milwaukee Journal. A web search revealed a social security record of a Francisca Falu-Torres born in the Virgin Islands in September 26, 1913 and dying in Puerto Rico, August 23, 2006, at 92 years of age, with her last residence in Santurce, PR. Was this the same Francisca in the Valldejuli’s kitchen? What stories could she have shared about the culinary life of the “Puerto Rican Julia Child”? Was she a part of the cookbook writing process? 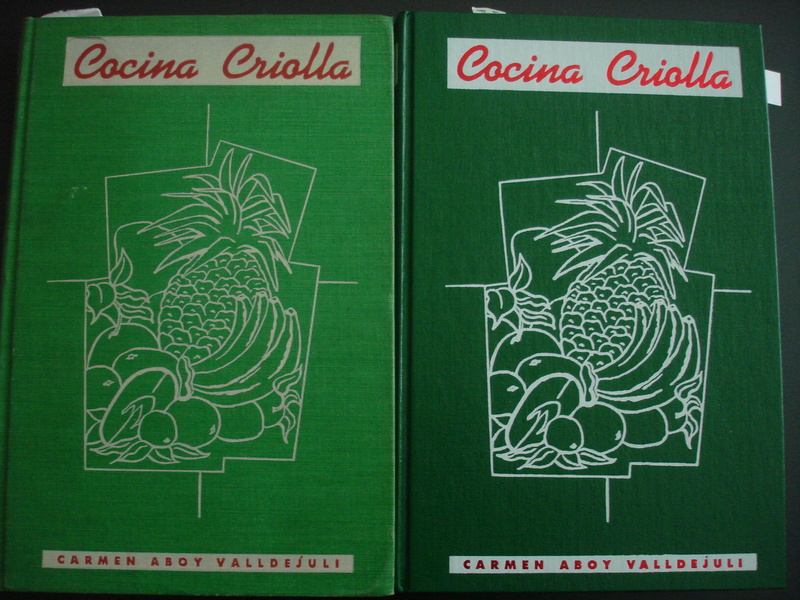 I have spent many hours with the first and last editions of Cocina Criolla (1954 and 2001, respectively). This exercise has sparked many questions about the author and the book in its historical context. 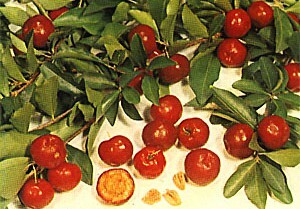 Valldejuli is an important part of the culinary memory and imagination of the Puerto Rican community in the island and abroad. Yet not much is known about her, her culinary influences, how she finally learned to cook, or where these recipes came from. Taking her recipes and dinner party instructions alongside the economic and political realities of Puerto Rico in the 1950s inevitably bring the picture of two different worlds in the same small island. Despite the many changes in Puerto Rico since the 1950s, Cocina Criolla has remained virtually unchanged throughout the decades. While Valldejuli does not ask us to pluck chickens in the 2001 edition, she still asks us to open coconuts. Some people follow her instructions with very delicious results, but not me. In all honesty, I have only made one recipe from the book, Bizcocho de Chinas (Orange cake), the orange juice version. And I certainly do not have plans of cooking my way through Cocina Criolla (a la Julie and Julia). Why have I not cook more from this book? That is certainly the topic of another, future post. In the meantime, please share your own experiences (or lack of experience) with Valldejuli (or your own national culinary icon). The song and video portrays the very interesting debate I want to explore next. First, what exactly are pasteles? For the non-Puerto Rican Spanish-speaking reader, the word pastel evokes the image of a pastry, in some cases a cake. Usually, we tend to explain pasteles simply as the Puerto Rican version of the tamal. If I may, pasteles are a much more complicated version. 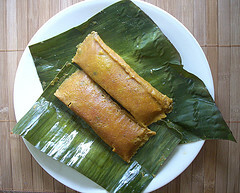 Let’s take for example the Cuban tamal as a point of comparison, using the recipe from Cuban culinary icon Nitza Villapol’s Cocina al Minuto. Her Tamal en Hoja has 11 ingredients in total and 5 steps, including cooking. In comparison, a recipe for a pastel may have as many as 22 ingredients and 33 steps. 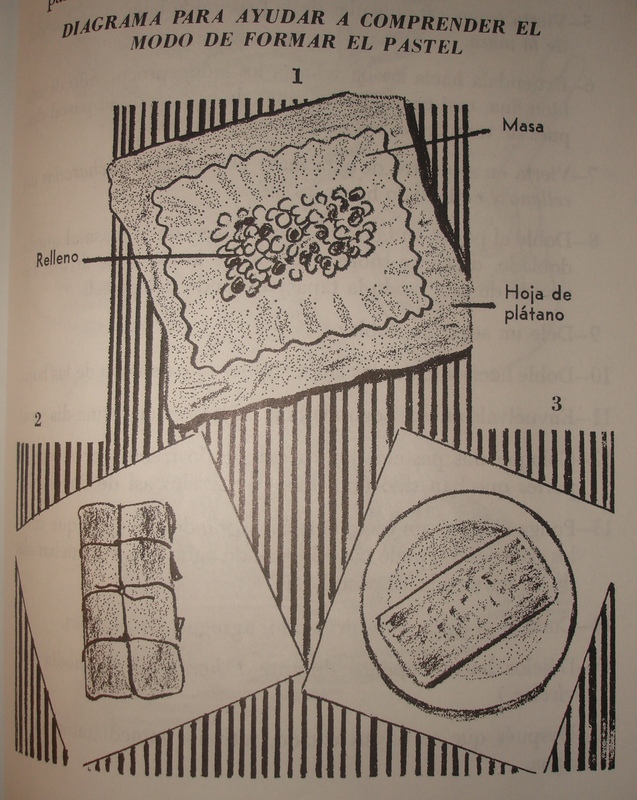 In Carmen Aboy Valldejuli’s Cocina Criolla (the Puerto Rican “culinary bible”), the recipe for her Pasteles “Mamie” takes 4 pages, dividing the process in three parts: the filling (16 ingredients, 11 steps), the dough (6 ingredients, 6 labor intensive steps), and the actual construction and cooking of the pastel (16 steps, including a diagram). Like most Puerto Ricans in my generation, I have never attempted to make pasteles. It is quite a feat and one I think most of us Puerto Rican food lovers might like to take on someday. We rely on small entrepreneurs, mostly Puerto Rican doñitas (and some dones as well), to take on the task and sell for about $2/pastel. Finding a “pastel connection” is not a straight forward act either, but once you find your connection, you are loyal to that person. You defend their pasteles, as your own achievement on finding this connection. You recommend them and fight with others as to who can bring to the table the best ones and at the best price. The last step in the pasteles’ preparation is to boil them for about 45 minutes. Go over the cooking time, and they are ruined. Next, you need to unwrap them, being careful of not getting burned or stained from the water with achiote hiding in the wrapping. And – finally! – the pastel is on the plate. Can you pass the ketchup? Just bringing this condiment to the table might be a sign of disrespect. How can you ruin a pastel with ketchup after all the work someone put into making it? Now, I have to say that in thinking of this issue I realize that we put ketchup on many things: burgers, eggs, rice, steak, fried chicken, beans, alcapurrias…However, these do not come with such an outrage. 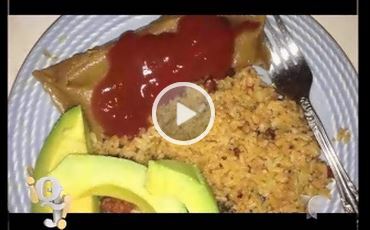 An academic take on the merging of pasteles with ketchup can bring the symbolism of this dish as the current state of Puerto Rican culture. The ingredients in the pastel, the root crops both from African ancestors and from Tainos are merged with contributions from Spain (pork) and the Middle East (garbanzo). The long process of preparing can be symbolic of our history and struggles, resulting in the very mixed Puerto Rican “race”. Is the rejection of this new ingredient, the ketchup, a rejection on the influence of the United States in our culture? Like ketchup on a pastel, U.S. influence in Puerto Rico has resulted in an ever increasing influx of fast food chains – and highly processed foods. This food colonization is not unique to Puerto Rico. We share this with other Latin American countries and the rest of the world. Globalization and the “Macdonalization” of diets worldwide is certainly a huge topic to be further unpacked. Is the adamant rejection of even trying pasteles con ketchup an assertion (conscious or unconscious) of Puertorriqueñidad? As some may reject pasteles con ketchup, are these same people rejecting Starbucks over the local café? Are these individuals skipping the ever increasing influx of US-based chains over the amazing array of local restaurants? But back at the more simple argument – devoiding the conversation from the politics of our Puerto Rican identity – the pasteles are just too labor intensive, too precious to ruin with this awfully processed red sauce. And yes, it is quite a processed product with high fructose corn syrup and unnamed “natural flavors”, as seen in a store-bought bottle. But what if you made your own? Could changing ketchup from an imported, highly processed bottled sauce to a home-made condiment bring the opposition to at least try the combination? A basic tomato ketchup is made out of tomato, onion, vinegar, sugar, and salt. With the help of a blender, you can make it at home. The process may take you about 30 minutes, depending on the ingredients, plus a 2+ hours of refrigeration for flavors to develop from a tomato sauce to ketchup. It is the sugar and the salt help accentuate the flavor of the pastel – that is, if used wisely. The ingredients themselves are not entirely foreign, and may even be included already in other parts of the meal. The controversy over pasteles with ketchup is hardly settled, and may continue on for years to come. Where do you stand in the debate? Please share your own views below.